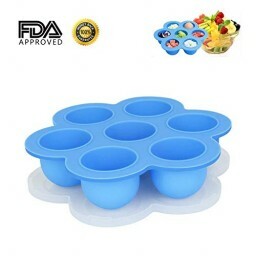 FDA Approved: Our egg bites molds are made of high quality food grade silicone, which is approved by FDA. 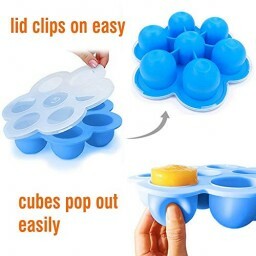 Just cook your nutritious egg bites by this silicone egg bites molds without worries. 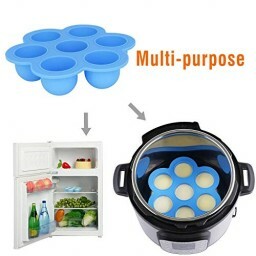 Tiny Body of Powerful Functions: This egg bites container bears -40 to 230℉, so it can not only be used as a container for freeze baby food, but also a food shape mold for baking egg bites or instant pot food. Seven Individual Portions with Lid: It is consisted of seven separated round portions for satisfying your different foods contain. Plus a hard plastic lid is offered for keeping the original flavour of your food. 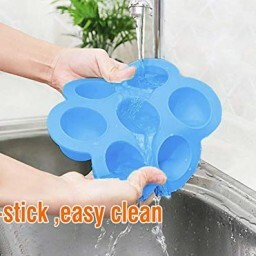 Easy to Clean: Dishwasher safe, and naturally non-stick for quick release, you can just wash it in the tap running water. Diameter: 8.25*8.25 inch, fits for 5, 6 and 8 quart instant pot.